This area has the highest population density in Rome, as its suburbs emerged in 1870. Most of the housing is old, built here between 1919 to 1960. 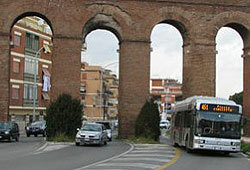 There are plans to improve this district, with a railway line added to make it more accessible to the rest of Rome and reduce traffic. There have also been efforts to beautify the area and show off its archeological treasures to the best advantage. Its most famous structure is the Forte Prenestino, built in the late 19th century as a fort but turned into a centro sociale, where cultural events are regularly held, in 1986.